Did you know the Thanks A Lot cookie has been around 10 years? It has. They have changed the way I do smores forever. I'm pretty active in a few Facebook groups and I'm of course active with my Service Unit. 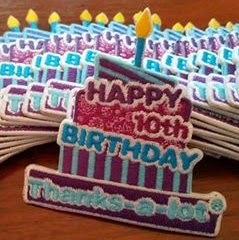 We are ordering Thanks A Lot Birthday patches for our Service Unit and we ordering extras for other people that may want them. SO, I thought I'd pass this opportunity along to my blog readers. Once supplies are exhausted, that's it. We are not reordering these again. They are fully embroidered and super cute. To keep it simple, PayPal is the preferred method of payment. You can use any card with that, too, if you aren't familiar with how PayPal works. If you want a patch or 10, fill out this online form with all your information and complete the payment portion. The patches arrive the week of April 27th and will be mailed out the following week to you! They are $2 each, plus shipping. We have a couple other patches for sale there, too. Feel free to order whatever you need/want/like. If you remember, put a memo in the notes section that you are a blog reader. I'd love to see if I get any sales from this. Was there any activity to go along with this patch?! Do u still have this thanks a lot patch?? no. we sold out last fall.